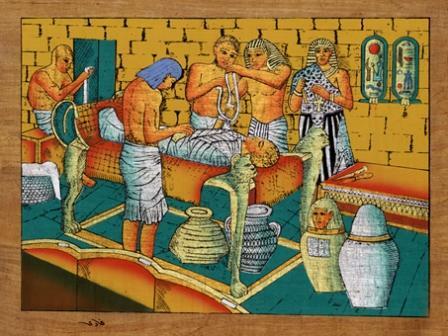 This is a most unusual work of papyrus art in that it shows the ancient art of mummification. A great gift for the Embalmer or Funeral Director in your life, it's also a fine artistic piece for any collector. It's 17 inches by 11 inches and is imported directly from Egypt. Each one is signed by the artist and is absolutely beautiful when matted and framed. The photo of this papyrus really doesn't do it justice, it's a color rich papyrus that is vibrant.